The use of cardiopulmonary bypass during surgery is the most challenging procedure in all the possible fetal cardiac interventions. Catheter-based fetal cardiac interventions have recently been developed and applied in the clinical setting for a particular category of congenital heart diseases. The intention was to improve long-term results by allowing the heart to grow normally before birth. However, the procedures that can be performed using catheter intervention are very limited, the primary examples of which are atrial septostomy, aortic valvotomy, and pulmonary valvotomy. There is still a group of congenital heart diseases, such as total anomalous pulmonary venous connection, hypoplastic left heart syndrome, pulmonary atresia with intact ventricular septum, and Ebstein's anomaly, for which long-term results could be improved or Fontan circulation could be avoided using fetal surgical cardiac intervention but may not be achieved using catheter intervention. 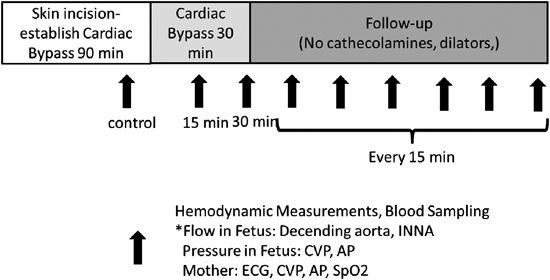 In 1985, Richter et al first reported an animal study on fetal cardiopulmonary bypass. 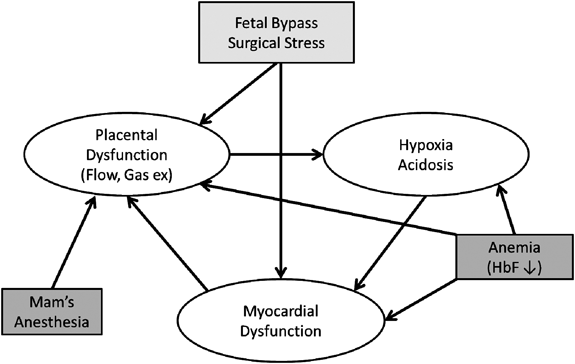 Since this report, which was over 30 years ago, several developments in this field have been achieved; however, there are no case reports on successful fetal cardiopulmonary bypass in humans. The aim of this study was to determine the current status of developments in fetal surgical intervention using cardiopulmonary bypass. ASD; atrial septal defect, APV; absent pulmonary valve, CA-RV; coronary artery-right ventricle, LV; left ventricle, MV; mitral valve, PA; pulmonary artery, PFO; patent ductus arteriosus, RV; right ventricle, RVOT; right ventricular outflow tract, TAPVC; total anomalous of pulmonary venous connection, TOF; Tetralogy of Fallot, TR; tricuspid regurgitation, TV; tricuspid valve. 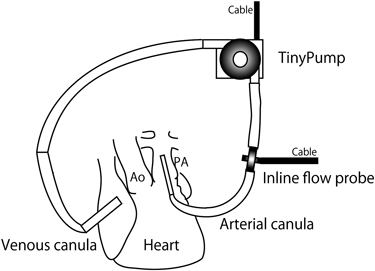 A typical circuit for fetal cardiac bypass comprises a Tiny Pump and an in-line flow probe. The priming volume of the circuit is 10 mL. AP: arterial pressure, CVP: central venous pressure, EKG: electrocardiogram, INNA: innominate artery.